Now, if you notice, there's a theme lately: we've been talking a lot of the Lakers titles, much like we talked about the Bulls championships during the summer/early fall. Well, after discussing the 2nd and 3rd title from the Kobe and Shaq era, and with Kobe in his final season, how about we talk about where it all started. The 2000 NBA Finals. The Lakers were truly a force to be reckoned with and after being swept by the Spurs in the 1999 playoffs, the Lakers would bounce back and have a magnificent 67-15 season to claim the no. 1 spot in the Western Conference. Now, for the Lakers opponents, The Indiana Pacers, their regular season road was a little less amazing, yet they still took the no. 1 spot in the Eastern Conference with a 56-26 record. The Pacers had been so close to the Finals before being stopped just short by the Bulls in the 1998 playoffs and the Knicks in the 1999 playoffs. Here they were back again and ready to make the Finals. Would the road be easy for both teams? Not at all. The Pacers started off with a rough 5 game series against the hungry Milwaukee Bucks team. After taking care of the Bucks, the Pacers ended up with a big victory over the 76ers in a 6 game series. As they inched closer to the Finals they would meet a familiar nemesis in the Knicks for the Conference Finals. Would they be able to redeem the previous year? We would get that answer in 6 games, as the Pacers won the series against the Knicks and moved on to their first NBA Finals. It would be a major deal for them and with all the pieces in place, the Pacers prepared. The Lakers would start off fairly interesting in the playoffs, barely edging a 5 game series against the Sacramento Kings, before winning a 5 game series against the Phoenix Suns. The toughest challenge would prove to be the Portland Trailblazers, as they pushed them to the limit in a 7 game series. It looked as if at times the Trailblazers would win the series but the Lakers held on and pushed forward to return to the NBA Finals for the first time in 9 years. As game 1 approached, the buzz continued to grow. The starting lineup for the Pacers featured Reggie Miller, Mark Jackson, Jalen Rose, Dale Davis and Rik Smits. The Lakers would have a solid starting lineup of Ron Harper, Kobe Bryant, Glen Rice, A.C. Green, and Shaq. The Lakers bench was also stacked as we went into the series, something that would truly benefit them in the long run, especially Brian Shaw, Rick Fox, Derek Fisher and of course, Robert Horry. Who would take home the trophy? 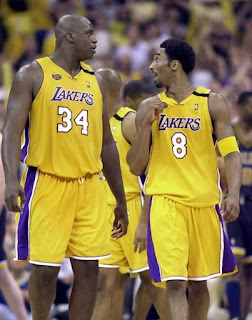 -The Lakers would walk onto their home court with a true focus and precision on walking away with the NBA Title. 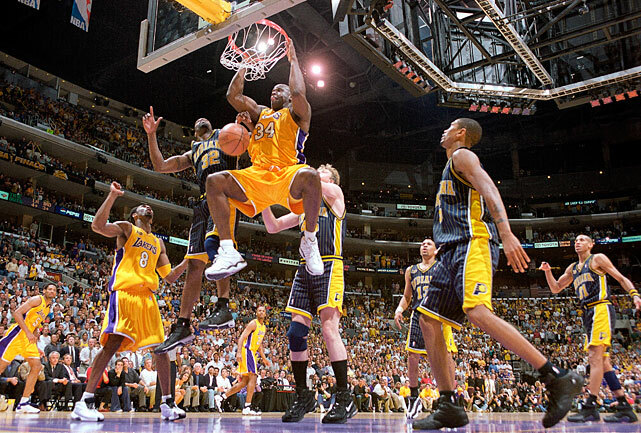 With Kobe and Shaq and the rest of the team ready to win a title, the Lakers dominated early on in the game. Shaq was nothing short of spectacular in this game, helping the Lakers get out to an early lead and maintain that lead, as the Lakers would end up taking game 1 in the series with a 104-87 victory. The Lakers were led by the superb performance of Shaq, who finished with 43 points and 19 rebounds, asserting his dominance easily. Mark Jackson would lead the Pacers with 18 points and 7 assists, but it wasn't enough to help them win. The Pacers looked to regroup in game 2. -This game started out almost evenly matched, and the Lakers couldn't claim control of the game too much at this point. However, they would still get lucky in some way and walked away with the victory to make the series 2-0. 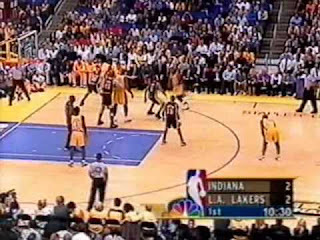 Now, the Pacers were led by the scoring of Jalen Rose who finished with 30 points, while Dale Davis pulled down 10 rebounds to keep the Pacers in the game. 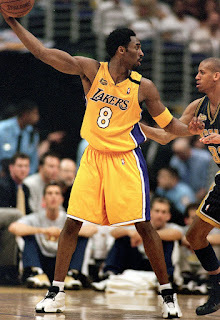 Kobe went down in the game with an injury and Ron Harper picked up the slack by scoring 21 points. Shaq would experience the whole Hack-A-Shaq period, as he attempted 39 free throws and end up missing most but he ended with 40 points and 24 rebounds to carry them to a 111-104 victory over the Pacers. Could the Pacers rebound from being down 2-0?? Or would the Lakers go up 3-0? 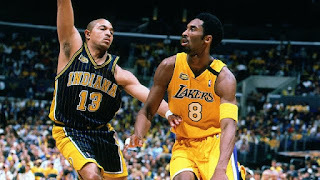 -If it wasn't known how vital Kobe Bryant was even in the Shaq era, Kobe missed game 3 for the Lakers and the Lakers struggled without him. Reggie Miller would step up big time for the Pacers and make an impact, finishing with 33 points to lead the team to a huge 100-91 win to make the series a little closer 2-1. The Lakers attempted to come back in the game but it was not enough and the Lakers fell short. Shaq had another amazing game, this one with 33 points and 13 rebounds. While Shaq was doing his thing for the team, many wondered if he could keep that up for the rest of the series. As game 4 approaches, the Pacers let out a sigh of relief and attempted to get to work on gaining an upper hand on the Lakers going forward. Would it be effective? -This series had been interesting so far and game 4 would be the craziest one of the series, as the game pushed to overtime. Up until this point, Shaq truly shined during the series and no one else really got a moment to be the spotlight, but as this game went to overtime with Shaq fouled out, Kobe would take over, hitting clutch shots to help seal the game for the Lakers in a 120-118 win. 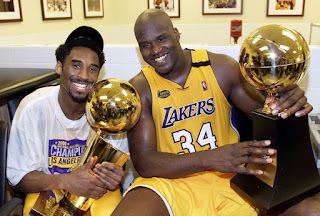 Kobe would showcase that toughness in this game after missing game 3 with an injury and Shaq would do amazing yet again, finishing with 36 points and 21 rebounds to give the Lakers a 3-1 series lead. The Pacers would have Reggie Miller get another hot hand for the game and finish with 35 points. The Pacers had their backs against the wall. Would they respond? -Yes they would. The less said about this game the better for Lakers fans. 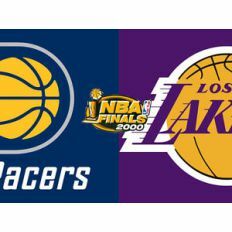 The Pacers would kill the Lakers in this game and have a boosted self confidence as a true result, though it was short lived. The Pacers controlled the entire game and would end up making the series 3-2, thanks to Jalen Rose and his success on the court with 32 points. The 120-87 victory was bad. After all the work the Pacers did in game 5, one would help it means the series was going to a game 7. Sadly it was not meant to be as the Lakers ended up winning, and taking home the trophy for the city. While the game was mostly close throughout, the Lakers just seemed to want it more. They would be led by the legendary Shaq and his 41 points and 12 rebounds this game, staking claim to his the Finals MVP title that I believed he set for himself. The Lakers win the game 116-111 and take the series 4-2. With the victory in the bag, the Lakers would celebrate their success and their first championship with newly appointed coach Phil Jackson. Your 2000 NBA Champions, the Los Angeles Lakers!